I found this delightful children’s book in our school library, where I was waiting for my next student. Once I started reading it, I knew I’d need to stay with it to the end. The inside flap made it sound much more dramatic than the story turned out to be, and in my own opinion, that’s a good thing. There’s a real gentleness about this children’s book that actually doesn’t need additional drama or hype. I particularly enjoyed the fantasy aspect of the story, where a baby griffin, who is supposed to be mythical, not only shows up in the lives of the children, but also communicates and learns to speak. 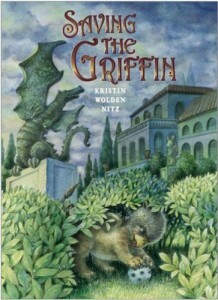 The ending was even more surprising, as they return the griffin to where it belonged. The small elements of other-worldly magic are what make this children’s book both unique and entertaining. There is also a fun sprinkling of Italian vocabulary in the book, which makes for a nice conversation about other languages. I can imagine that some children who have traveled overseas, would particularly enjoy the Tuscany setting of this little story. Overall, this makes a nice, easy reading children’s book especially for third and fourth grade students.